Brussels (AFP) – Women in the European Union earned an average of 16 percent less than their male peers in 2016, official statistics agency Eurostat said Wednesday. “For every euro that a man earned by the hour, a woman made an average of 84 cents,” Eurostat said in a press release issued ahead of International Women’s Day Thursday. Worldwide, women earn on average 23 percent less than men. At the current pace it would take 70 years to close the gap, according to the International Labour Organization. The gender pay gap in Europe was only slightly better than in the United States, where women are paid 20 percent less than their male peers. Within Europe, the wage gap is particularly high in Germany and Britain, at 21 percent each. Romania, Italy and Luxembourg have better records, with the gap at five percent, while in France women earn 14 percent less than men. 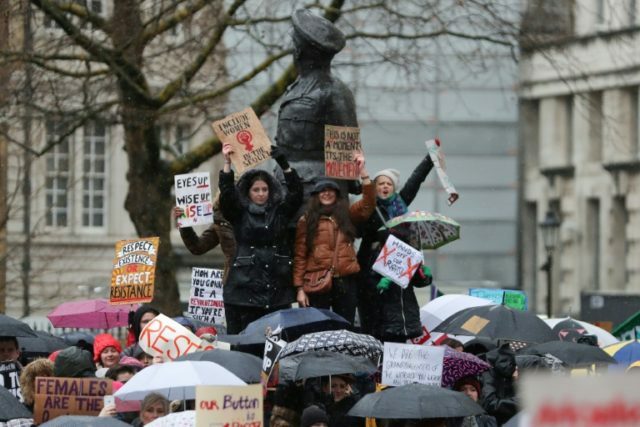 The figures came a day before the world marks the 40th International Women’s Day, in a year rocked by the #MeToo movement against sexual harassment and abuse, and a reinvigorated debate about women’s rights around the globe. The past year has also seen two million women take to the streets in support of women’s rights, especially in Washington. But the road to equality remains long, with violence against women still an everyday occurrence and gender pay gaps the global norm. On Tuesday, 15 of the European Commission’s 28 members published a declaration reaffirming gender equality as one of the EU’s keystones. In February 2018, 36 percent of leading commission positions were held by women. Commission President Jean-Claude Juncker said he wants women to fill 40 percent of the top positions by the time his mandate ends in October 2019.